If you don't speak up for groundwater, who will? 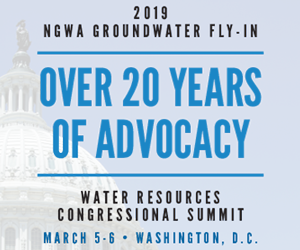 Let your voice be heard and take advantage of the opportunity to talk with elected officials in Washington about groundwater issues at the 2019 NGWA Groundwater Fly-In and Water Resources Congressional Summit March 5-6, 2019. Working together with the Irrigation Association and the Water Quality Association, the Fly-In will increase the water industry's profile on Capitol Hill regarding the availability, quality, and safety of our nation's water resources. It will help make members of Congress aware of the important role groundwater plays in providing drinking water, supporting agriculture, and fueling various sectors of the economy. The current government shutdown shouldn't have an impact on the Fly-In, as Congress is still in session each week so meetings with congressional delegations will go on as scheduled. If the shutdown remains ongoing or begins again, the agenda for the policy briefing could be affected as officials from the administration are invited. Bolstering support for drinking water infrastructure improvement. The Fly-In will open on March 5 with a keynote luncheon, followed by congressional and policy speakers, an NGWA policy briefing, and a reception. On March 6, the day will start with an informal breakfast, then meetings on Capitol Hill throughout the day (the schedule for meetings will vary based on congressional availability), closing with an optional happy hour with Fly-In participants. Make sure your voice is heard - register today!